If you’ve never owned a flat iron before, the surprising amount of available options might surprise you. When you’re staring at a wall of different models, choosing the best flat iron for natural hair can be a daunting task. This article will help you narrow down your choices and find the best flat iron for your type of hair. We’ve done the hard work for you and read through tons of flat iron reviews. We narrowed down the competition and have found the top flat irons on the market today. If you love creating different looks, check out our recent blog posts on the best hair brush straightener and hot air brushes for styling ALL types of hair. When you’re finished with this article, you’ll be able to purchase a flat iron with confidence. There are 3 main types of flat irons. The first features ceramic plates, the second features tourmaline while the last one utilizes titanium. Both are highly effective but they each have their own specific perks. Here’s a quick list of the benefits of each type. If you’re a traveling hair stylist or work at a salon, you’re probably looking for a flat iron that can work the same amount of hours as you do. 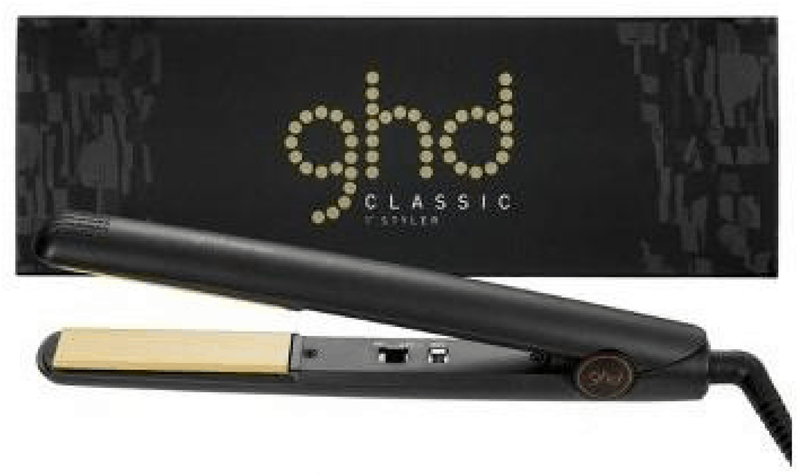 The GHD Classic 1 Inch is ideal for the professional world. It features advanced ceramic technology that will leave you with smoother and shinier results. You won’t be limited when you use this straightener thanks to its nine-foot cord. If you’re looking for the best professional flat iron, this GHD flat iron is your answer. It’s durable, made from only the best, high-quality materials and it heats up lightning fast. This is the only ceramic flat iron that will be able to keep up with your hectic schedule and busy demands. When you have thick hair, you want a flat iron that will be able to tackle the job without making you late. 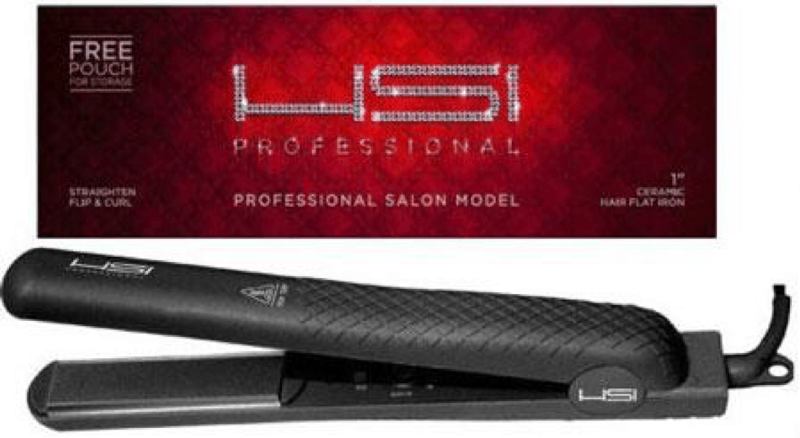 The HS1 Professional Titanium Tourmaline Ionic Flat Iron Hair Straightener has the power that you need and can deliver in record time. With a digital LCD temperature control feature, you’ll always know the exact level of heat that you’re applying to your hair. But that’s not all. Its a dual voltage flat iron which you can use it while on vacation abroad. You’ll also love the round body shape design. This unique shape allows you to also add flips and fun curling style to your hair without switching styling tools. Also, one of my black girlfriends swears this is one of the best flat irons for black hair. Another great option for thick hair is the Nano Titanium by Mia Adora. Remember how titanium plates deliver even heat distribution. This flat iron will make you a believer in titanium. You’ll love how healthy your hair looks, even after repeated use. The ultra-thin and lightweight design makes for effortless use. Its digital temperature display will amaze you. You’ll experience up to 450 degrees of heat in just a few seconds. If you’re a little forgetful, that’s okay. With an automatic shut off safety feature, you don’t need to worry about running out of the house with a hot flat iron still on. Purchasing a flat iron can be an investment but it’s not a risk with this company. They include a two-year warranty with every purchase and a 30-day money back guarantee. When you have fine hair, you are constantly concerned with the damage that styling products could be doing to your hair. Luckily, we’ve tracked down the best flat iron for natural hair that will work with thin and fine hair. This ceramic hair straightener features plates that are contoured and curved. This means that the flat iron will glide smoothly and evenly. your hair won’t snag so there’s no risk of breakage. Let us remind you how important it is to use a lower heat setting if you have fine hair. This flat iron has a wide range of settings, including a low setting of 250 degrees Fahrenheit. This will still provide you with results but you definitely won’t smell burning hair. It’s probably no secret that people with curly hair love what a flat iron can do for their style. It can provide them with an entirely different look in a flash. But when you’re altering extra curly hair, it becomes that much harder to get professional results that last. That’s why we recommend the Bio Ionic Onepass 1.5” flat iron. You’ll love how fast this unit heats up. Simply plug it in and in less than ten seconds, you have the high heat needed to conquer thick and curly hair. If you would describe your hair as thick, wavy or frizzy, you’ll be amazed at the results this flat iron can provide you with. Your hair will be left softer and completely straight, often with just a single pass of the flat iron. Imagine the time that you’ll save with this hair flat iron. 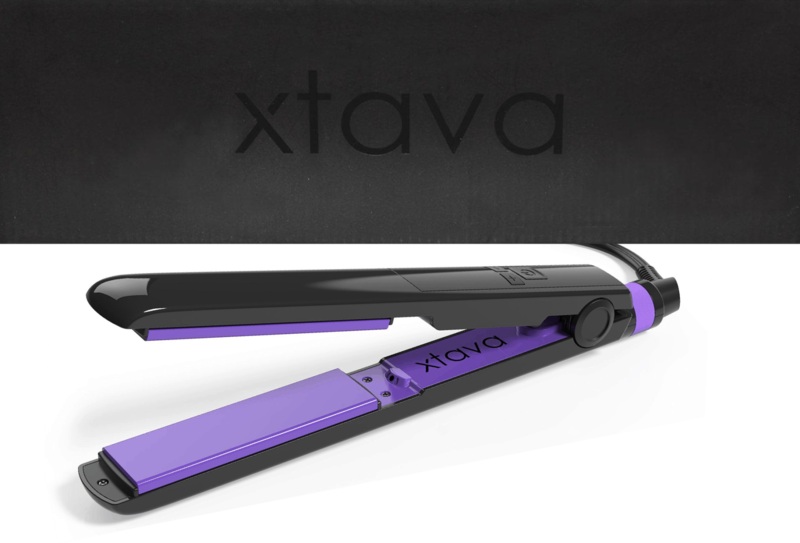 We love the Xtava Goddess Flat Iron for a variety of reasons but its striking appearance is what will first get you. It has a modern look with a fun color scheme and sleek design. You can leave this sitting out in your bathroom and it won’t be met with a disappointed look from visitors. This ceramic hair straightener heats up a bit more than it’s competitors. It features a heat range of 150 degrees Fahrenheit going up to 450 degrees Fahrenheit. This means that it can tackle your hair, no matter how much curl it holds. Your unit will come with a traveling and storage bag so you can easily take it with you on business trips or vacations. Your hair style doesn’t need to suffer because you are away from home. Frizz can be unforgiving. It seems like there are some days where it doesn’t matter what you do. The frizz keeps coming back. 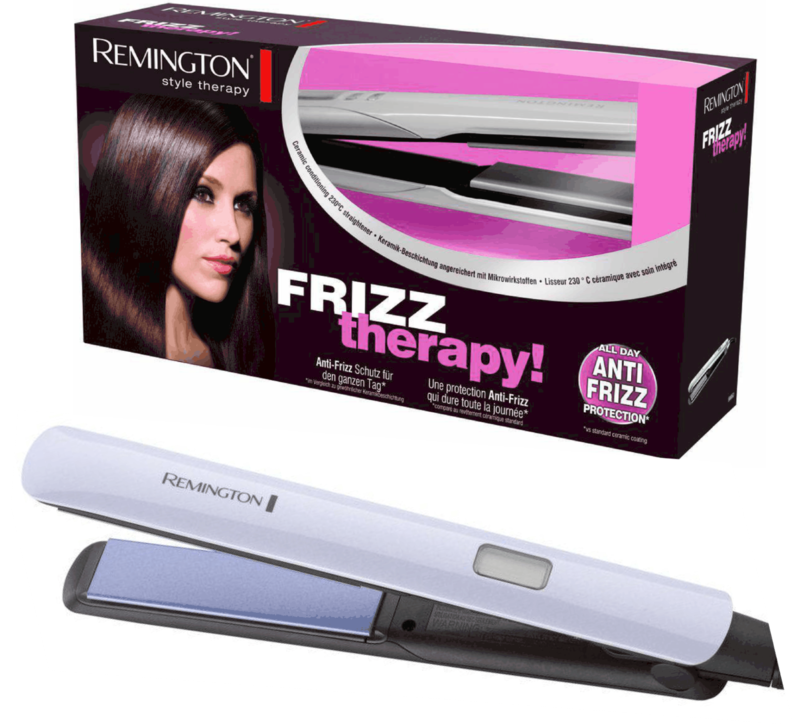 If you find yourself in this predicament quite often, check out the Remington Frizz flat iron. This flat iron is perfect for long hair. It provides you with results that are guaranteed to last up to 15 hours, no matter how much humidity Mother Nature throws your way. That’s because this straightener features technology that is proven to provide less frizz. Instead, you’ll be enjoying sleeker, stunning shine. The plates float, which means that they have tension to grip each individual strand of hair. But the smooth plates glide with ease so you won’t experience uncomfortable hair pulling. If you’re after the best hair straightener that won’t break the bank, the Remington S9520 Salon Collection 2-Inch is an ideal choice. Let us explain how this unit delivers everything you’re looking for without you having to break apart your piggy bank. Most affordable flat irons have a cheap and clunky feel to them that’s noticed right away. But you won’t notice that with this flat iron. 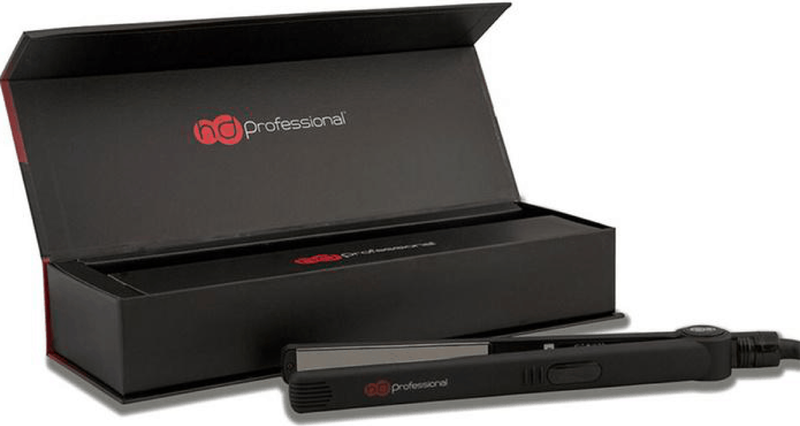 Instead, you’ll be impressed with the professional feel and look of this straightener. It also features floating plates, which isn’t common with other flat irons in its price range. You can rest assured that each individual strand of hair will be treated with this hair flat iron. 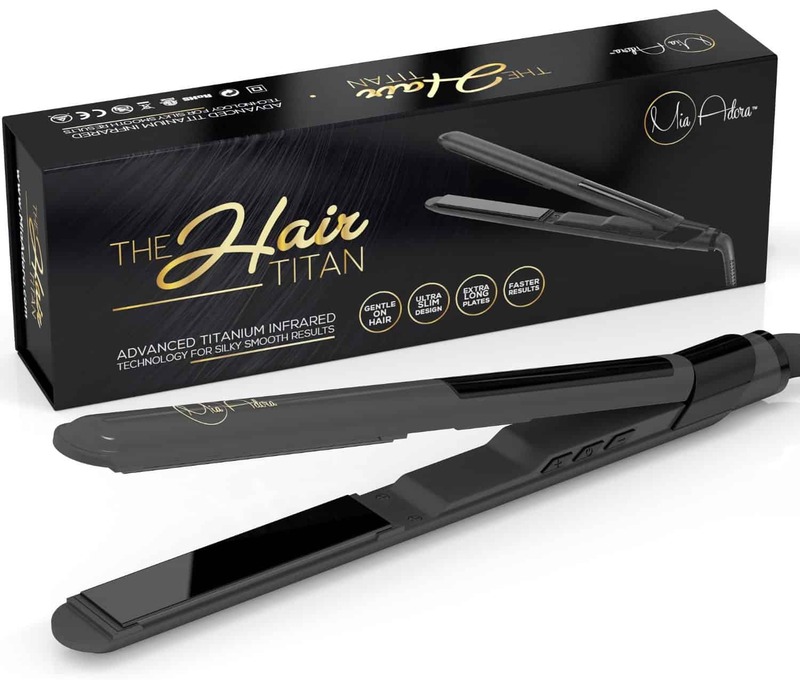 We can promise you that this product will work just as well as a high-end titanium flat iron. It will straighten, curl and give you smooth, fabulous results that last all day. Top flat irons are needed by people with short hair too. Our first option for you features titanium-infused ceramic plates, so you get the best of both worlds. With an easy to read digital temperature display, you’ll know the exact heat that you’re applying to your hair. If you enjoy having short hair because of the promise of faster styling, you’ll still be able to take advantage of this perk with the Rusk Rsk668 Professional. It heats up in just a few seconds and is designed to keep you moving. It has a nine-foot swivel cord to keep you from getting tangled up. Remember to use a heat protective serum with this flat iron, like you should no matter your hair type. 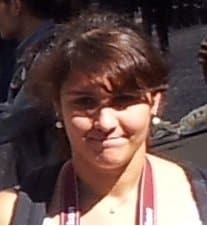 But with short hair, be sure not to overdo it or your hair will be weighed down. The good news is that this particular model is designed to work even better when product is applied. 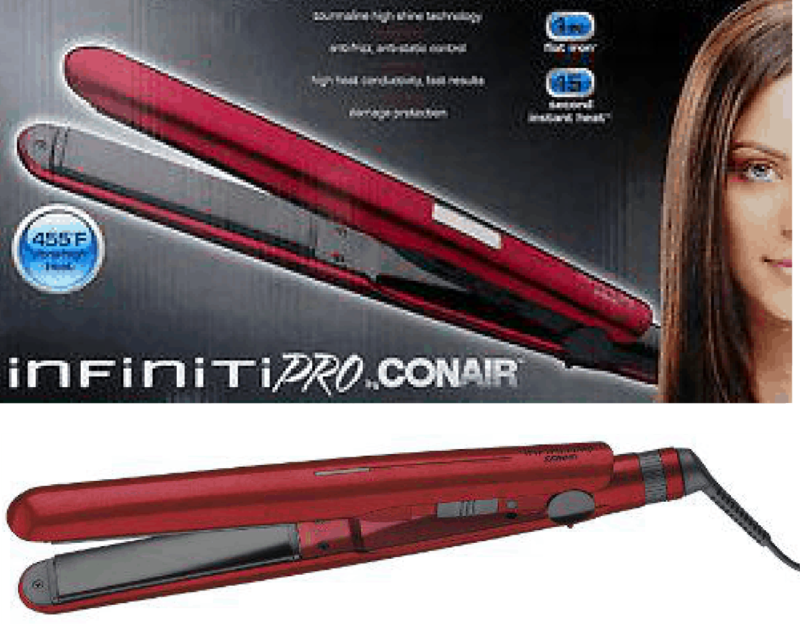 Another option for people with straightening needs and curly hair is the Infinity Pro by Conair. You can enjoy up to 89% straighter hair with less frizz compared to competitors. 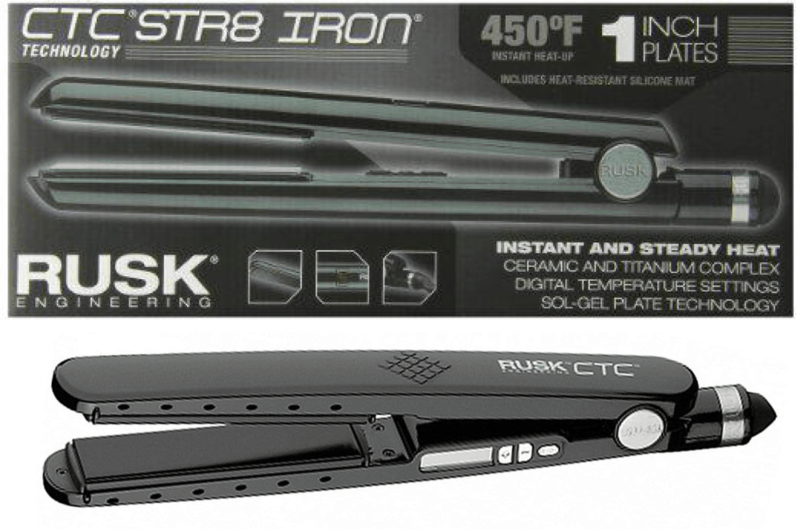 The tourmaline ceramic technology utilized by this flat iron helps provide you with less frizz and less static. The iron does this by emitting negative ions, which help produce healthy looking hair that shines and impresses. You’ll look like you just stepped out of a professional salon every day. With a low heat setting, you don’t have to worry about causing damage to your hair. With a single pass, you’ll be left with straight hair that’s in a better condition than when you started. How amazing is that?! Now that we have combed through our list of hair straighteners, let’s take a moment to discuss how to really use a flat iron. The best flat iron for natural hair won’t do a thing if you aren’t operating it correctly. When used correctly, a straightening iron will provide you with the safest way of altering your hair. Follow these steps to learn how to properly use a straightening iron. Wash and condition your hair if needed. Pat your hair dry to prevent excess frizz. Before your hair dries completely, apply a thermal protection serum throughout. Comb with a wide-toothed comb after application. Blow dry your hair on the lowest setting. Point the hair dryer downward. Plug in your hair flat iron and turn it on. Set it to the appropriate setting. The thicker your hair is, the higher setting you should use. Separate your hair. Try to make sections that are one or two inches thick. You will only work on one section at a time so pin the other sections back. 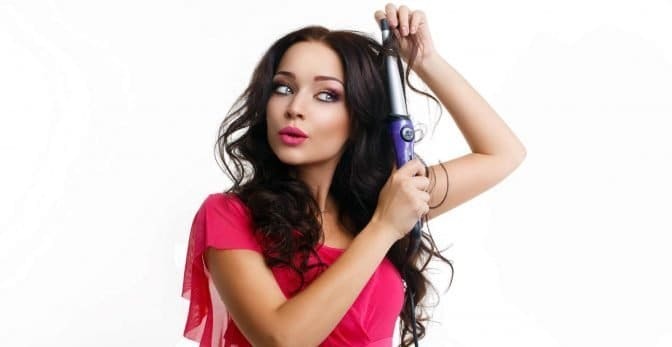 Grab the first section and place the straightening iron as close to your scalp as possible. Clamp down, letting the heated plates touch, while keeping your hair between them. Run the flat iron down the section of hair in a fluid and steady motion. Don’t allow the flat iron to sit in one spot for too long. Repeat this motion until your hair is completely straight. This will vary depending on the thickness of your hair and the size of the selected section. Use hair spray if needed. If you follow these instructions and avoid using excess product or holding the flat iron in one place for too long, you should be left with gorgeous straight hair and minimal damage. You’ll love the look that hair straighteners can give you. What Plate Material Is Best for My Hair Type? Not all flat irons feature the same material when it comes to their plates. Does it make a difference? You better believe it! Think of the plates as a flat iron’s claim to fame. A flat iron can only be as good as its plates allow it to be and this is completely controlled by the material that they are made from. We already know about the main different types of materials utilized in flat iron plates but when it comes to your specific type of hair, which should you lean towards? To start, let’s keep it simple. Tourmaline is the best material that a plate can be constructed with and it will work well with any type of hair. Because it can actually improve the condition of your hair through negative ions and infrared heat, even the most damaged of hair can be styled with a flat iron that features tourmaline. If your hair is thin and fine, both ceramic and tourmaline are excellent options. Ceramic will be much more affordable though. Titanium can still be a possibility but you’ll need to make sure that it has a lower heat setting or you risk damaging your hair. 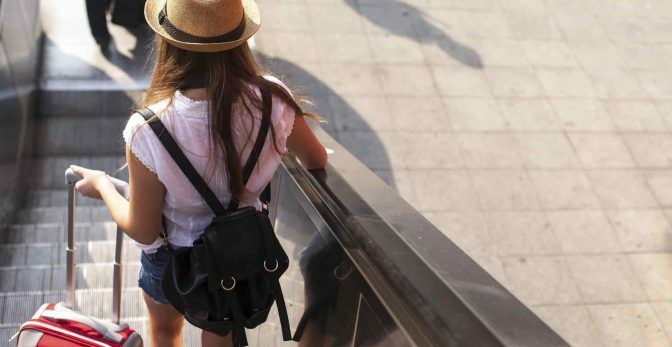 Remember that titanium plates heat up very quickly and even though they won’t create damaging hot spots, high levels of heat could wreak havoc on thinner hair. For thick, course or curly hair, you’ll want to make sure that your flat iron is able to not just get hot enough but stay hot during the entire straightening process. Titanium is the ideal plate material (if tourmaline is out of your price range) and will help to straighten and control volume without damaging your locks. Ceramic is also an option but because most ceramic plates are only ceramic coated and mostly constructed with less than superior materials, your flat iron will cool off too quickly and leave you feeling frustrated with your results. If you have what can be classified as normal hair, meaning that it’s not too thin or overly thick, holds moisture well and isn’t too oily, feel free to experiment with all different types of plates. What will be more important is temperature and plate size. Unless you’ve been using flat irons for quite some time and know exactly what temperature works best with your hair, you’ll want to get a flat iron with temperature control. Generally, the thicker your hair, the higher temperature you’ll need. The opposite is true as well, with thinner hair needing lower temperatures. Here’s a quick guide that will help you use the right temperature on your hair. If your flat iron is too hot, you could be seriously damaging your hair. In general, never go above 420 degrees Fahrenheit. At this temperature, the keratin protein in your hair begins to melt, which will lead to split ends and broken strands. However, if the heat is too low you’ll be left with minimal results and dull hair. It may take a few tries before you find the ideal temperature for the condition and thickness of your hair but always remember to start low and build your way up unit you find a temperature that provides shine and results without damage. There are still more decisions to be made! What size plate should you buy? Does it make a difference? Of course it does! The general rule of thumb is that the longer your hair is, the larger plate you should use. A one-inch plate will work for most hair lengths and styles but if you’re looking to get the most out of your flat iron, take a few other factors into consideration. If your hair falls below your shoulders (or is thicker than most) you’ll want to choose a plate that’s, at least, 1-1/4-inches. Think of it this way. A larger plate will allow you to cover more ground (or hair) in less time and because you aren’t going over the same section several times, you’re minimizing the potential for damage as well. Save time and your hair! If your hair is cut above your ears, you will want to lean towards a slimmer plate. Something around ¾-inches is ideal. Using a thinner plate will give you much more control as you work with the hair closest to your scalp. You’ll also be working with smaller sections most likely so a larger plate will only get in the way. When choosing between hair straightener sizes, the most important factor to take into consideration is the health of your hair. You’ll want to make sure that the size you choose is working with you instead of against you. Depending on how often you use your flat iron, you’ll need to periodically clean it to avoid product build up that can cause your styling tool to stop working properly. So how do you clean a flat iron properly? Take a look at this quick guide. Heat the flat iron slightly. You should be able to touch the plates without being burned. Unplug before continuing. Dampen a towel with warm water (must be warm to avoid shocking the plate). Very gently rub each plate where you notice build up. Avoid scrubbing and be careful not to scratch the plate. Continue down the handle of the flat iron. Use a cotton swab to clean any buttons or crevices. Clean all surfaces. Allow flat iron to dry completely before using again. You can also look into purchasing a hair straightener cleaner that you can apply to the plates and other surfaces to remove tougher areas of product build up. Know your hair type: By having an idea of what you need out of your flat iron, you’ll be in a better position to narrow down your choices of top flat irons. Decide on the most important features: Know if you want a titanium flat iron or a ceramic hair straightener. Decide how important a digital temperature screen is to you. This will help eliminate potential contenders. Expect the best: Don’t settle because of a lack of confidence. A little preparation can make all the difference. Finding the best flat iron for natural hair is worth the effort. The perfect flat iron is out there for you. Now that you’re knowledgeable of the top hair straighteners on the market, you’re ready to find your perfect match. Don’t suffer another day without the hairstyle you’re after. You’ll never regret the purchase of a professional flat iron.